I have some good news and some bad news. First, the bad news: I am still on leave from my therapy dog jobs. The good news is that I am doing very well in physical therapy thanks to the hard work by Robin, Stacey, and April. I think they really like me because I pick up things for them, and, when their hands are full, I open doors for them. I also bring them tissues when they sneeze. I am beginning to think that they sneeze just to see me do that. It’s all a piece of cake for a well-trained former service dog in training! I go to physical therapy twice a week. When I go there, I stay all day, kinda like going to a spa. I do exercises; I get stretched; and I walk on the underwater treadmill. Oh, they also give me treats. The only other memorable thing that happened this month is Halloween. I didn’t go trick or treating, but I did dress up. I was the lazy lion or better said the very handsome lazy lion. Sammie was the floozy fairy. We liked posing for pictures, but liked taking the costumes off even better. That’s it ‘til next month. Click here to read Scotty’s full blog. 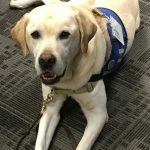 Hero Dogs, Inc. improves quality of life for our nation’s heroes by raising, training, and placing service dogs and other highly skilled canines, free of charge with lifetime support of the partnerships. Job Opportunity: Kennel Technician (2 part-time positions) NOW FILLED! to America's heroes. Funds donated to a specific dog may be utilized to support general program needs.